This fourth century British kingdom was based on the Celtic tribal territory of the Demetae and its subsequent Roman civitatus designation (a civitatus being the Roman equivalent of a modern county, one which was based on the borders of each former tribal territory. This could be broken down further into pagi which were based around towns or major settlements). Initially, it was bordered by its North Wales counterpart, early Gwynedd, and to the east both by the early Pagensis territory, and Mid-South Wales in the form of Cernyw. Demetia was apparently created circa 382 by one of the many sons of Magnus Maximus (although perhaps they were sons only in the sense that Maximus had created their positions and set them up in semi-independent power - it's hard to be at all certain). Demetia certainly bore the Romanised form of its name throughout the fourth and fifth centuries, although it was also known to later chroniclers as the 'Kingdom of South Wales'. 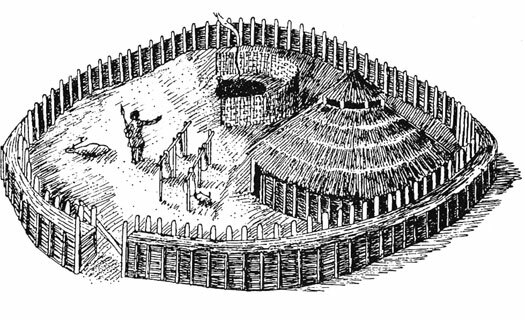 Its early centre was at Castell Dwyran (in Carmarthenshire, roughly halfway between Carmarthen and Haverfordwest), but the Demetian tribal centre at Maridunum (Moridunum) probably remained in use as the region's main trading point (this became the Roman basis for modern Carmarthen). Demetia's first 'king', Antonius, was charged with protecting the southern half of Wales in much the same way as Cunedda was set up in Gwynedd as the 'king' of North Wales. Some of the territory he controlled was passed to younger sons, but which territory is not clear. The core of his holdings, however, was Demetia. Irish raiders were causing the British widespread problems throughout the fourth and fifth centuries. To combat this a wandering sept of the Déisi tribe were probably settled in Demetia by Magnus Maximus to act as protectors of the coastline. Existing evidence confirms this by suggesting that the Roman authorities asked for the help of Aed Brosc in keeping Irish pirates away from the western coast of Britain. When the last British king died without a male heir, the Déisi were on hand to fill the breach. By this time they had become Romanised themselves, and soon became indivisible from their Western British (Welsh) subjects. 'King of South Wales'. Son of High King Magnus Maximus. Antonius Donatus Gregorius, son of Magnus Maximus (at least, according to later claims), is placed in command of the southern section of Britain's westernmost coast (equivalent to later South Wales) during the reorganisations of Magnus Maximus prior to his expedition into Gaul to claim the imperial title. It also seems to be Magnus Maximus who settles a sept of the the Irish Déisi in Demetia. The act would fit in with a general policy of this period of shoring up Britain's defences by moving entire groups of people to defend the weaker areas - most notably a group of Romanised Venicones to Gwynedd. Aed Brosc seems to be the Déisi leader who is contacted and invited to settle in Demetia, probably in the period between 380-383. Upon the death of Magnus Maximus, Antonius appears to be accepted by the Demetae inhabitants of his territory. He retains control of the region, which means that he is also successful in driving off the Irish raiders who have been threatening the coast. Mentioned as a king by later traditional sources, he more probably holds the rank of decurion (also mentioned by some scholars) or a magistrate who is based at Maridunum. He and his successors have been given Welsh names by later chroniclers (Anwn Dynod in his case, Anwn from Antonius and Dynod from Donatus), but it is much more likely that they bear Latinised names and conduct themselves as Romans. Some elements of his life may later be incorporated into the Arthurian stories (see feature link). 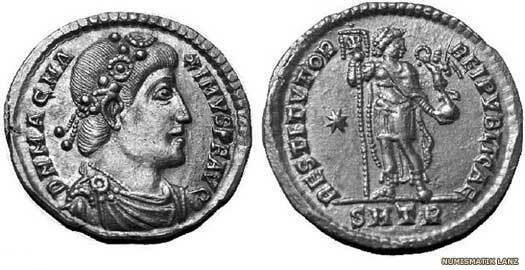 Demetrius, son of Antonius, is also accepted by the Demetae as their first hereditary king of the Late Roman period. This is probably not a difficult prospect as Magnus Maximus, his grandfather, is held in such high esteem by the people of western Britain that he is remembered as a founding figure of much of later Wales (which may also be a reflection of his influence - and even his original military rank and posting - in what is to become Wales). According to later tradition, Demetius - in his Welsh form of Ednyfed ap Awn - has at least two sons, Gloitguin (or Gloitgwyn) and Dyfnwal. The name of the former seems at first sight to be the Welsh form of a Latinised name, but there is some difficulty in accepting him because the next ruler of Demetia, Clotrius, is claimed as being the son of Demetrius. Gloitguin is also referred to as the father of Clotrius, so perhaps Gloitguin dies before he is able to govern Demetia himself and is therefore forgotten by some later chroniclers. However, 'Gloitguin' looks like a nickname meaning 'blue-white', and also looks suspiciously similar to the base element of the name of Caer Gloui. Is it a pun? As for Dyfnwal, he may govern a sub-unit of Demetia (a pagus), and may be the father of the Honorius (Ynyr Gwent) who marries St Madrun, the daughter of Vortimer (Gwerthefyr), the ruler or magistrate of Gwent. Again though, the name seems suspicious. The first element of Dyfnwal is 'dyfn' (modernised as 'Devon'), which is how the kingdom of Dumnonia comes to be known. The second element, 'wal', means 'wealas', which is a term frequently used by Angles and Saxons to denote the presence of Britons (Welsh), in this case the Britons of Devon. Even the name Demetius is suspect here, being suspiciously close to 'Demetia'. All three have to be treated with great care as they all seem to be created by using the names of places to form identities. Son (or grandson). Last British ruler of Demetia. Son and heir, but predeceased his father. With Clotri's only male heir dead, his daughter Gweldyr is the sole heiress to the kingdom (but see the fascinating argument by the Ancient Welsh Studies website that Clotri 'himself' is actually a daughter of Demetius rather than a son). Although she may be considerably younger, she marries Triphun of the Romanised Déisi Irish, who have been settled in Demetia to help defend it from Irish raiders. The kingdom's name is retained but is altered by the Irish pronunciation of it so that, within about a century, the accepted pronunciation is Dyfed. The Déisi (or Déssi or Deisi) tribe of the County Waterford region in Ireland were apparently settled by the existing Roman authorities in the region of Demetia by 382 (probably as an acknowledgement of a situation which already existed). Their leader, Aed Brosc, was one of his people's key figures. His grandfather, Eochaid Allmuir, had been forced to leave his homeland after a bid for independence failed, and was severely crushed by the Irish high king. The descendants of Aed's eldest son, Urb, founded the kingdom of Brycheiniog between 420-450, while his younger son, Triffyn Farfog, married the heiress of the British Demetian kings. Like most Irish royalty, Eochaid claimed descent from Beli Mawr, the Celtic sun god who was also claimed as a second century BC high king of pre-Roman Britain, through his son, Miled. Another branch of the expelled Déisi (pronounced 'day-shee') became the Dál gCais clan of Thomond. The name Dyfed (also known as Dyfor) originates from one of the former Roman civitates within the kingdom, and seems to have been the Déisi pronunciation of the older name of Demetia. The early Déisi settlers were very receptive to the benefits of the Roman way of life, and gave their children Romano-British names. These were recorded by the early Welsh in Welsh format, and later rulers became completely Welsh in background as Roman influence faded. The Déisi rulers of Dyfed initially used the Roman title of 'Protector' (protictoris) instead of the British equivalent of magistrate or princeps. 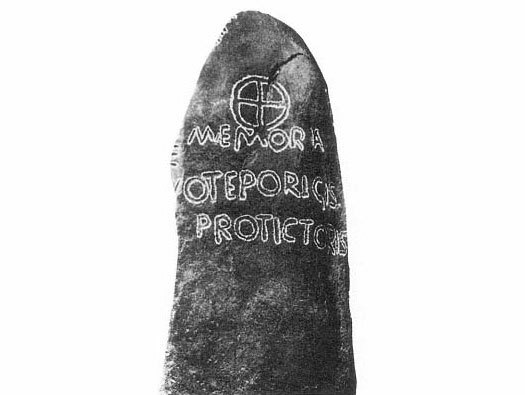 This practice continued at least as far as Vortipor, whose memorial stone was discovered at Castell Dwyran. High King of Britain. m Don ferch Mathonwy. Linking the well known figure of Beli Mawr of pre-Roman Britain to Miled seems to be totally spurious - little more than a faked claim to have inherited the ancient crown of Britain. A better study of the Déisi pedigree shows that Miled is the mythical Míl Espáine whose Celtic sons led the exodus from Iberia to southern Ireland where they form the kingdom of Munster. These people are probably Celtiberians, a migration that can be accounted for by a look at modern DNA evidence in the Irish. Many of the names found in this list are also claimed as early Milesian high kings of Ireland. Son. High king 14 years. King of the Milesians in Munster. m Tea. Subsequent to Enna there may either be three generations missing from this list, or they have been added later. They are Lava 'the Fierce' Luire (Lorc), son of Enna; Beotach (Beothachtach) son of Lava; and Blatact son of Beotach. Son of Enna (or Beotach). Son. Lewy 'of the Red Circles'. Son. High king of Ireland. Legendary high king of Ireland, Fedlimid Rechtmar, is the father of future high king, Conn Cétchathach (from AD 116 according to Ireland's mythological timeline). Two other sons are Fiacha Suighe and Eochaid Finn, both of whom are mentioned in medieval sources. Fiacha is also claimed as the ancestor of the Dal Fiachrach Suighe, meaning the 'Seed of Fiachra Suighe'. Son. Brother of High King Conn Cétchathach of Ireland. According to legend, Cormac mac Airt is high king of Ireland ('Ard Ri na Eireann') during the time of Finn mac Cuill (Fionn mac Cumhaill, or Finn MacCool). He is also one of the country's most popular high kings, being mentioned in many tales and poems and also in the Irish annals, the Annals of the Four Masters. He fights many battles, subduing the Ulaid and Connachta and continuing the ongoing struggle to bring Munster to heel. In the story The Expulsion of the Déisi, the great-great-great-grandson of legendary high king of Ireland, Fedlimid Rechtmar (AD 104, according to Ireland's mythological timeline), is Art Corb. His four sons are expelled from Tara following a failed bid to take the high kingship. Cormac mac Airt is also mentioned in the eighth century text when he is blinded by Óengus Gaíbúaibthech of the Déisi. As no high king can remain in place if he bears a physical blemish, Cormac is replaced by Eochaid Gonnat, although a year later he is killed in battle by Cormac's son, Cairbre Lifechair. Art Corb's sons each go their own way. 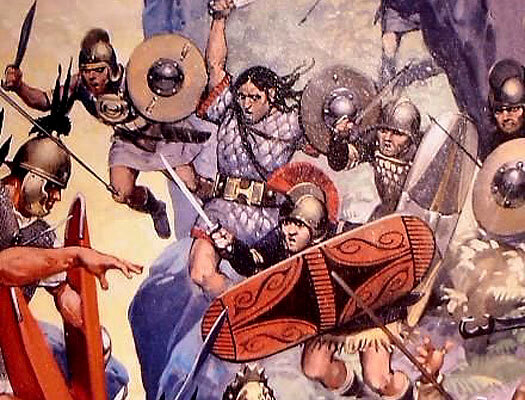 The group led by Eochaid Allmhuir (Allmhuir meaning 'over-sea') settles in Demetia around the start of the fourth century, while another eventually settles amongst the Déisi of southern Munster (the Déisi Muman). These events have been tied to Scotti (Irish) pirate raids along the length of Britain's western and southern coasts in the fourth and fifth centuries, and to the foundation of the Brito-Irish kingdoms of Dyfed and Brycheiniog. Another branch of the expelled Déisi becomes the Dál gCais clan of Thomond. During the high kingship of Cairbre Lifechair in Ireland, his sons Fiacha Sraibhtine and Eochaid Doimlen kill Óengus Gaíbúaibthech of the Déisi. In an attempt to heal the breach, Cairbre betroths his daughter, Sgiam Sholais, to a Déisi prince but the the fianna (a form of semi-independent war band) demands a tribute of twenty gold bars. Deciding to cut the fianna down to size, Cairbre gathers a huge army from Connacht, Laigin, and Ulaid, with support from Goll mac Morna and his followers from the fianna itself, while the Déisi and Munster side with the fianna. Cairbre is victorious at the resultant Battle of Gabhra, but dies in single combat against Oscar, grandson of his own father-in-law, Fionn mac Cumhaill (Finn MacCool). Oscar dies of his own wounds shortly after. The only fianna survivors are Caílte mac Rónáin and Fionn's other son, Oisín. The subsequent high kings are brothers Fothad Airgthech and Fothad Cairpthech. A year after acceding, one kills the other and the survivor is then killed by Caílte mac Rónáin of the fianna and the followers of Caibre's son, Fiacha Sraibhtine, at the Battle of Ollarba. Son of Art Corp. Sometimes named first Déisi leader in Demetia. It seems to be Magnus Maximus, the father of Antonius of Demetia, who settles the Irish Déisi within the territory's borders. The act would fit in with a general policy of this period of shoring up Britain's defences by moving entire groups of people to defend the weaker areas - most notably a group of Romanised Venicones to Gwynedd. Aed Brosc seems to have been the Déisi leader who is contacted and invited to settle in Demetia, probably in the period between 380-383. Son. Historical leader of the Déisi in Dyfed. Son. Migrated into the Brycheiniog region. Anlach, grandson of Urb mac Aed, marries Marchel, whom Celtic works describe as the 'heiress of Garthmadrun'. The same works give Anlach's father as Cornac or Coronac, who is generally linked to Cormac mac Urb of the Déisi. Given the calculation that the Déisi had arrived in Dyfed around AD 300, this would give them ample time to become integrated into the regional nobility and for their leading sons to marry the offspring of the surviving Brito-Welsh nobility, hence Anlach's marriage to Marchel. Upon Anlach's death, Garthmadrun becomes Brycheiniog. Brother of Urb. m Gweldyr, heiress of Demetia. First Irish king. Triphun is an Irish version of the Latin 'tribune'. Also shown as Trestin, this is clearly a rank rather than a name. His name seems to be Valerian, making him Tribune Valerian, a Romanised Irish king. As the fourth generation of Déisi to have been raised in Britain, the tribe now has roots in the country and has clearly developed a certain degree of reliability and trustworthiness. By taking a Roman name, Valerian has become part of the British ruling elite, so much so that he is able to marry Gweldyr, the Romano-British heiress of Demetia. In later Welsh works he is Triffyn Farfog ('the Bearded'). Aurelius Ambrosius of Caer Gloui is apparently a leader of a British council, which presumably answers to Vortigern. It is his decision to confirm the Irish Déisi as commanders of the Demetia area of the west coast to counter the threat of Irish raiders. Vortigern acquiesces and assigns Ambrosius 'Dinas Emrys and all the western lands', suggesting that Ambrosius becomes the architect for the defence of these western areas. This is motivated by the council's reluctance to depend entirely on Saxon mercenaries, with their constant demands for increased provisions, especially in an area were they would be lightly supervised. The Déisi have already been settled for some time and would be self-supporting. There is a probable Irish presence at Dunster Castle (Dindraithov or Dindraethou to the Welsh) in the early post-Roman period. This is a fort which overlooks the approaches to Exmoor, four and-a-half kilometres (three miles) south-east of Minehead in Somerset (roughly on the edges of Dumnonian territory). The modern castle may not be the same site as the post-Roman fort, which could be located a little way inland. Irish settlers are frequenting Somerset at this time, which suggests that they are people who have already been accepted into Britain, such as the Déisi of Dyfed. They are not large in number but they do remain for a long time. Nearby Glastonbury is spoken of as 'Glastonbury of the Gaels' thanks to its shrines of St Patrick and St Brigit. The fort features in the list of twenty-eight cities of Britain in Nennius' Historia Brittonum, appearing as Caer Draithou, and is mentioned in the Life of St Carannog (of Ceredigion). Son. Aricol Lawhir (Long-Hand) mac Triffyn. Agricola bears another Romanised name, just like his father, showing that the Déisi kings of Dyfed have become fully-fledged members of late Romano-British society. Later variations of his name include the fully Welsh Aricol Lawhir, the latter meaning 'long-hand'. He holds court at Lis Castell (Lydstep) near Din Bych (Tenby). He is also reputed to be a patron both of the church at Llandaff and of St Euddogwy and St Teilo, the bishops of Glywyssing. Euddogwy is the son of Budic II, high king of the Bretons of Vannetais, whom Agricola takes in after he is expelled from his lands. The minor vassal state of Caer Goch (or Caer Gawch - probably a later form of the name) emerges within the territory of Dyfed. It is held by Cynyr Ceinfarfog (the Welsh form of the name which probably dates to the eighth century or later), otherwise known as Cunoricus (the Latin form of the name, which is much more likely to be the version used by the man himself - the modern form is Kendrick). However, 'Cynyr' can be traced back to the Irish name Connor which is also used in the formation of the name Conchobhar (meaning 'lover of hounds'). The likeliest explanation is that Cynyr is Déisi Irish, and that he adapts his name so that it becomes familiar to Romano-British ears. In Welsh a 'y' can be pronounced in two ways, either as the English 'y' or as a 'u'. In this case it would be a 'u', so that Irish Conner becomes early Welsh 'cunur'. The transition to Cunoricus as a Latinised Connor/Conchobhar is more difficult to accept, thanks to the '-ic' in the middle, although it is still possible. The appellation of 'ceinfarfog' means 'fair bearded', possibly referring to a blonde beard but equally possibly to a black beard, as the Celts (and their modern Welsh descendants) have a well-developed sense of humour when it comes to names. Cunoricus governs cantref Pebidiog from Castell-Coch (Caer Gawch, although there are three places with this name, this one being near Mynyw, close to St Davids). Caer-Gynyr (later known as Caer Cai) near Bala in Penllyn is also claimed as being his - which creates an interesting scenario. By the end of the fifth century Penllyn is apparently part of the sub-kingdom of Rhos, itself a division of Gwynedd. However, it seems unlikely that its first ruler is in place before AD 480, which raises the interesting prospect of Cunoricus being a Romano-British warlord or official who is replaced or succeeded by the newcomers who now rule Gwynedd. It is certainly a sign of the times on Britain's western coastline. Cunoricus is also the Sir Ector of Arthurian legend, who raises the young Arthur as his foster son prior to the latter becoming high king. Son of Agricola. High King. King or 'Protector' of Dyfed. Vortipor is clearly a powerful figure in British history, as noted by his being included in the list of high kings of Britain. Vortipor's name has been recorded in various ways, from the Latinised Vortipor itself, to the Gaulish Voteporix, and the (perhaps) more genuinely original Vortepor mac Aricol. Even this has been recorded as Gartbuir mac Alchoil (in The Expulsion of the Déisi, written in the eighth century), and Guortepir (from an eleventh century pedigree). Towards the end of his life, 'grey with age' and a widower, Vortipor is named by Gildas as the 'tyrant of the Demetae'. He also leaves behind a memorial stone which confirms this epithet. Around 1880 the stone is incorporated into a stile at Castell Dwyran (by now St Teilo's Church). It is later moved to a field in front of Gwarmacwydd House, Llanfallteg, before being donated to the Carmarthenshire Antiquarian Society. Quite possibly originally associated with a Bronze Age barrow, and also positioned with reference to the Roman road west of Carmarthen, a simple ring cross tops the inscription. 'The use of 'memoria' and the layout of the cross and inscription suggest Christian contacts with the Continent or possibly North Africa. Vortipor is 'Demetarum tyranne Vortipori', which translates as 'Vortipor, tyrant of the Demetae', tyrant in the sense that he had held ultimate authority over the kingdom. The use of the Latin term 'protectoris' suggests a title originally referring to a member of the Roman imperial bodyguard, and may be an hereditary title. It dates to the late fifth or early sixth century, precisely the time of Vortipor. There are remains of an Ogham inscription along the stone's top left edge, this being the early medieval script used to write down the Irish language. The Bernician Angles successfully destroy the kingdom of The Peak around this time, during a general expansion that also sees the fall of Dunoting around the same time. King Sawyl Penuchel is forced to flee to Wales. 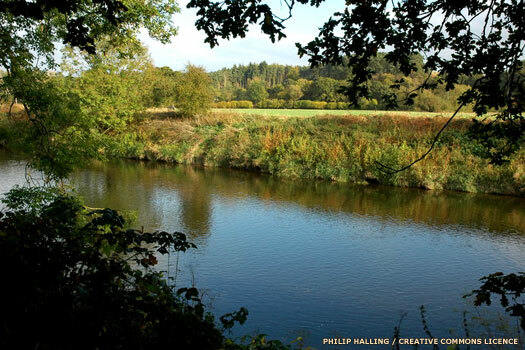 There is a story in the Life of St Cadoc that places him at Allt Cunedda near Kidwelly, within Dyfed's territory. However, the name of the location links it to Cunedda of Gwynedd, suggesting that his campaigns to clear Wales of Irish raiders had extended much farther south than is otherwise known. The story about Sawyl in Wales has him and his warband stealing food from Llancarfan Abbey (hard times, clearly, for this dispossessed king). St Cadoc follows them and finds them sleeping under a tree. He cuts off their hair and flees to a bog. When Sawyl and his men follow the bog claims them. It is unclear if this is the same Sawyl, but the approximate dates for the saint coincide with his approximate dates. Son. Named after Arthur Pendragon (High King). Born c.570-85. Son. King of Dyfed & Brycheiniog. Son. King of Dyfed & Brycheiniog. Also known as Gwlyddien. Ceindrych ferch Rhiwallon, princess of Brycheiniog, marries her distant cousin, Cloten, king of Dyfed, and for the space of three generations the two kingdoms are united. Son. King of Dyfed & Brycheiniog. Brycheiniog passed to brother. During Rhain's rule, Dyfed is invaded by Seisyll, king of Ceredigion. He takes Ystrad Towy, and Rhain's dual kingdom is split in two. Both areas appear to have been known for a time as Rheinwg after their king, but now Rhain is forced to pass the sub-kingdom of Brycheiniog to a younger brother, Aust (or Awst). The precise status of the kingdom of Brycheiniog at this time is open to some question. Three of the sons of Rhein ap Cadwgn appear to divide Brycheiniog between themselves (probably following the death of Rhein himself). Some of their immediate descendants are referred to as 'king', but seem more likely to be lords of cantrefi (districts containing a hundred settlements) or commotes (one third or a half of a cantref). It may be the case that Naufedd Hen, Tewdos, and Elisse are in competition to see who comes out on top as the kingdom's ruler. Son. Seemingly also king of Brycheiniog (or part of it). Owain was the last male descendent of Aed Brosc. Although some sources suggest Hyfaidd ap Bledrig as the next ruler of Dyfed, a reign of about eighty-two years is clearly implausible. A ruling generation or more seems to have been lost, and it would not have included Hyfaidd's low-born father. Owain ap Meredydd had been the last male descendant of Aed Brosc, so who really succeeds him? Could the kingdom have splintered with several claimants each grabbing a share, to be slowly pulled back together by the end of the century? Son of Tangwystyl ferch Owain and low-born Bledrig. Son. No heir. His dau, Elen (893-943), m Hywel Dda. Vikings have been wintering at Quatford (near Bridgnorth in Shropshire, part of western Mercia), but in the spring of this year they ravage the kingdoms of Brycheiniog, Gwent, and the Gwynllg region of Glywyssing. Asser records that Elisedd of Brycheiniog requests help from Alfred of Wessex, but another reason for this may also be due to pressure from Anarawd ap Rhodri, the powerful king of Gwynedd and Deheubarth who is keen on expanding his areas of control. Dyfed's Hyfaidd ap Bledrig may be another southern Welsh king who, during his lifetime, similarly appeals to Alfred for aid and support to ward off Anarawd. Cadell ap Rhodri of Seisyllwg and his son, Hywel Dda, conquer Dyfed. Hywel is granted control of the kingdom, a position which is an entirely legitimate claim in principle (if not in law) thanks to his marriage to Elen ferch Llywarch ap Hyfaidd. King of Deheubarth (Gwynedd, Powys, & Seisyllwg). Hywel Dda is the son of Cadell of Seisyllwg. When he accedes to the throne of Deheubarth in 916 he is able to claim to rule a greater South Wales. In 942 he gains Gwynedd and rules a united Wales until his death. Once Gwynedd becomes detached from the remainder of the territory, former Dyfed provides the heartland along with Ceredigion (the former Seisyllwg) of the kingdom of Deheubarth.